TEFLON CLASSIC NONSTICK COATING: Teflon Classic nonstick cooking surface, provides healthful nonfat cooking options and easy clean up. This Hascevher Crepe Pan will provide you with healthy cooking results with minimal oils or fat. smooth bottom ensures even heating and quick cleanup. SUPERIOR NON-STICK PERFORMANCE: This Hascevher Teflon classic nonstick crepe pan is exceptionally durable and scratch resistant, safe for use with metal utensil, Soft Touch Black Bakelite Pan Handle is strongly a heat safe comfortable non-slip grip that resists rust and dullness This pan is essential for big breakfasts, crepes, tortillas, quesadillas, roasted vegetables, grilled sandwiches, omelets, scrambled eggs, saute's of mushrooms, onions, peppers, etc. ULTRA DURABLE & DISHWASHER SAFE: Dishwasher safe but hand washing recommended. For hand cleaning first use a paper towel, wooden, or plastic spatula to remove off any loose food from the pan; then use a soft nylon scrubber, sponge, or paper towel sprinkled with a few drops of dish-washing soap to wipe the nonstick surface clean. Smooth bottom with no grooves will make it a breeze to wash away after using it. CONVENIENT DESIGN: Durable aluminum construction for fast and even heat distribution and the interior features a long-lasting, nonstick finish, Lightweight aluminum body and elegantly crafted oven-safe stay cool long riveted handle built for convenience and style. The light aluminum body promotes easy cooking in the kitchen. Multifunctional nonstick pan for creating crepes, omelets, pancakes, grilled cheese sandwiches and more. Sloped sides facilitate flipping and removing crepes and pancakes with ease. Quality, heat responsive nonstick cookware with stay cool handle. Just clean it with a wet paper towel. This pan is essential for big breakfasts, crepes, tortillas, quesadillas, roasted vegetables,grilled sandwiches, omelets, scrambled eggs, saute's of mushrooms, onions, peppers, etc.. CREATE THE BEST CREPES AS A MAIN DISH OR DESSERT WITH Hascevher 9 INCH CREPE PAN. 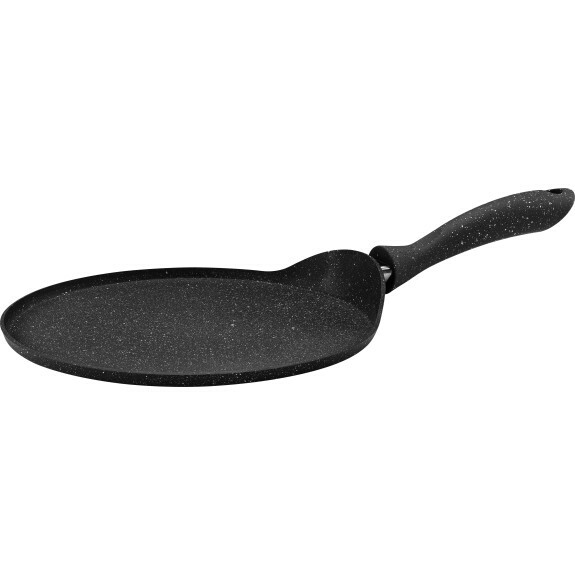 The crepe pan has a shallow rim to make perfectly round crepes every time and the handle is a Soft Touch Black Bakelite Pan Handle to perform the perfect flip. Teflon Classic nonstick cookware are perfect for low heat cooking and retains heat better than any material. CREPE IS THE FRENCH WORD FOR PANCAKE WE THINK. IF YOU HAVE EVER TRIED TO MAKE THIS TREAT AT HOME, YOU KNOW HOW IMPORTANT IT IS TO HAVE THE RIGHT PAN. Good thing you found the Hascevher Crepe Pan to solve all of your problems. It has the perfect size, weight, and heat conductivity to pull off this culinary staple. Plus, our patented Teflon classic nonstick coating ensures you will get a golden brown finish without all of the mess! We are Pleased To Offer An Exciting New Variety Of Specialty Pieces Of Teflon Classic Non-Stick Cookware That Make Every Day Cooking Tasks A Pleasure.